Intro: A few of us were just recently enjoying a brown ale at a local brewery and noting how few good brown ales seem to be available on a regular basis in the Seattle market. Well, here’s another option for you. This beer was originally known as Redhook Nut Brown Ale, and it debuted as Mudslinger last year. It returns this year as the brewery’s spring seasonal. Description: Pours a crystal clear dark amber with big head. The aroma is mild, but pleasant, and has mostly nuts and light roast coming through. The flavor is subtle chocolate, light roast, vanilla and nuts. It finishes dry, and the beer is very balanced. It’s refreshing and light, but it really falls short if you’re looking for even a medium-bodied beer. It’s certainly not a bad beer, it just is what it is: a light brown ale available for a reasonable price in six-packs at retailers all over town. Available at local grocers and retailers through April. Mudslinger is a Nut Brown Ale with a Medium body and a fresh aroma. Its malty flavor is layered with light chocolate, caramel, brown sugar and a hint of vanilla. Six barley malts and two hop varieties result in a surprisingly smooth, well balanced dark beer. 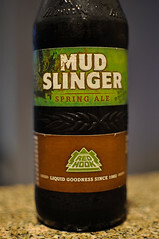 Mudslinger pairs nicely with grilled meats, stews, fowl, and even smoked oysters or salmon. Available on the West Coast from January through April.